Nearly everything in today’s world has some digital component or counterpart. Consider that for a moment, along with the idea of how much big data companies make. Tech like smartphones, computers and tablets, smart home gadgets, geospatial hardware, telemetry devices — it all generates data or digital content. That means someone — or something — must collect, process and then store it somewhere. Cloud computing and remote technologies are the obvious solutions for most backups. We can push data to a remote, offsite server farm or center where it is both securely protected and housed for significant periods, leaving the local storage free to accommodate even more data. That’s pretty much exactly what Amazon’s Snowball data transfer devices are. Companies can offload sensitive data to the Snowball, portable storage hardware which is then transported to Amazon’s data storage center. It is clear that for something like Snowball to work, however, there must be a lot of data in flux. Especially when considering that the 18-wheeler carrying Snowball units can hold up to five million times the bytes of the Library of Alexandria. The Library of Alexandria is one of the most famous libraries in existence, including many texts and readings from classical antiquities. The earliest surviving figure puts the total number of books at over 200,000. To put it even more into perspective, more than 2.5 quintillion bytes of data are generated per day across the entire internet. That number has been accelerated by modern technologies like IoT and smart home tech, obviously, but it has always been impressive. It makes one wonder — just how much data is the average company or service provider generating? What does that much data look like, and what is comparable? Here are the stats from four of the biggest tech companies out there right now. More than 3.7 billion humans now have regular access to and use the internet. That results in about 40,000 web searches per second — on Google alone. Furthermore, over half of all those web searches take place on mobile devices. It is likely the web search totals will continue to grow as more and more people get their hands on mobile devices across the world. In 2012, Facebook’s system was generating 2.5 billion pieces of content and more than 500 terabytes of data per day. There are just as many “likes,” photos, and data scans too. It was massive then, and it’s certainly grown over time. Today, there are two billion active users on Facebook and counting, making it the largest social media platform in existence. About 1.5 billion people are active on the network per day, all generating data and content. Five new profiles join Facebook every second, and more than 300 million photos are uploaded, too. One wouldn’t think that 140-character messages comprise large stores of data, but it turns out that the Twitter community generates more than 12 terabytes of data per day. That equals 84 terabytes per week and 4368 terabytes — or 4.3 petabytes — per year. That’s a lot of data certainly for short, character-limited messages like those shared on the network. Amazon generates data two-fold. The major retailer is collecting and processing data about its regular retail business, including customer preferences and shopping habits. But it is also important to remember that Amazon offers cloud storage opportunities for the enterprise world. Amazon S3 — on top of everything else the company handles — offers a comprehensive cloud storage solution that naturally facilitates the transfer and storage of massive data troves. Because of this, it’s difficult to truly pinpoint just how much data Amazon is generating in total. Instead, it’s better to look at the revenue flowing in for the company which is directly tied to data handling and storage. The company generates more than $258,751.90 in sales and service fees per minute. For anyone interested in seeing additional stats, check out this infographic from Domo. Looking at these numbers, it’s apparent just how much data is in flux across these platforms. It is also important to remember these brands make up a handful of the companies utilizing customer and usage data in the current landscape. Missing even still are some of the additional influencers like Microsoft, Pinterest, and even Google’s alternate platforms such as Gmail, Hangouts or Google Drive (Google Docs). What may come as an even bigger shock compared to all these stats and numbers is that 90 percent of all the data we have was generated within the last two years. That amounts to 2.5 quintillion bytes of data created per day, over just the last two years. As a society, we have created more data in just the past few years than has ever been generated since humanity’s inception. How insane is that? As we introduce more technologies and adapt existing ones — like IoT, AI and machine learning — that data generation will continue to grow. Naturally, acceleration also means more innovative uses, platforms and channels as well. Technology like driverless vehicles, automated manufacturing hardware, smart home devices, and even office hardware will all contribute to an acceleration in data generation. We will need somewhere to store, ways to process and analyze it and a multitude of platforms to make use of it. Driverless vehicles, for instance, will need to utilize the data coming in to offer safe, reliable rides to their owners. Data never sleeps and will forever be generated — at least it certainly seems that way. 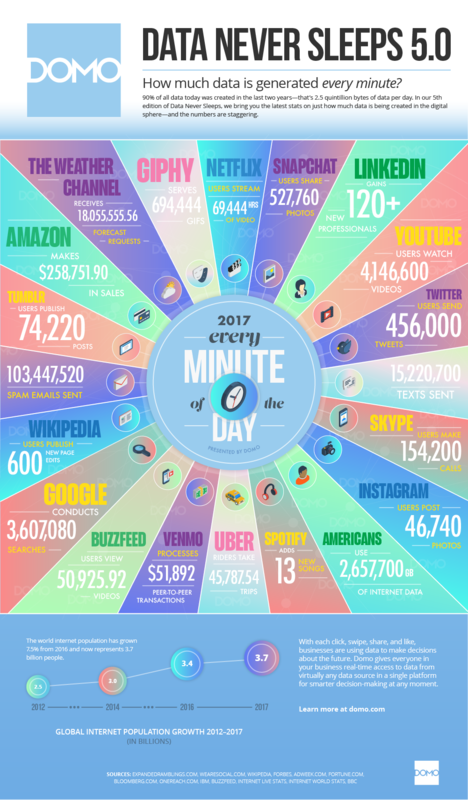 The post Here’s How Much Big Data Companies Make On The Internet appeared first on SmartData Collective.